Solid soaps are often regarded as old fashioned but I think people misjudge them. They can be a little messy looking in the soap dish but I do find them economical and inexpensive. It goes without saying that my soaps needs to be SLS/SLES free and handmade. That way I can guarantee the quality and support a UK business. 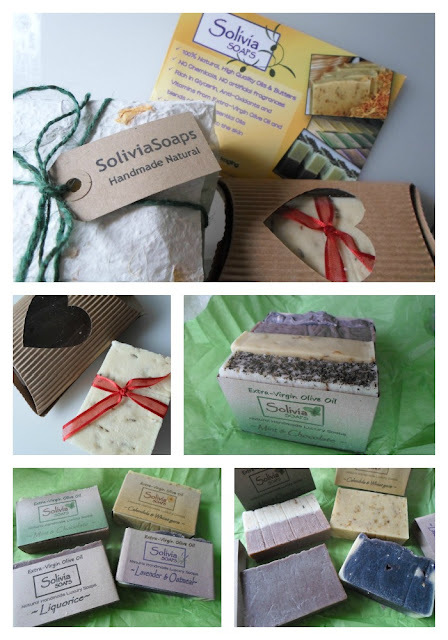 A couple of weeks ago I received a package from Solivia Soaps which contained the following soaps - Lavender and Oatmeal, Mint and Chocolate, Liquorice, unscented Calendula & Wheat germ, 100% Extra-Virgin Olive oil with a dash of aromatic Lavender. Solivia Soaps is run by Alberto who is originally from Italy. The company is located in East London and their passion is to make high quality, natural soaps using the finest plant ingredients. Soaps are made using traditional Italian methods and Extra Virgin Olive Oil is the main ingredient. Their soaps are free from artificial colours, fragrance with essential oils, 100% biodegradable, vegan friendly and cruelty free. As you can see from my pictures my soaps arrived in pretty packaging which is environmentally friendly. I am using these soaps for washing my hands. They are a generous size so I found cutting them in half made them easier to manage. I started with the Mint & Chocolate because it’s a little bit different from other soaps I have reviewed. I love the fragrance, it’s not overpowering but it has a gently pop of minty freshness. I have noticed that as the soap ages (with constant use) the fragrance has lost some strength but despite this I still enjoy using it. The ingredients are gentle and my hands never feel dry or tight. This also goes for the Calendula & Wheatgerm both ingredients are gentle and may be helpful if you have eczema. I have been impressed with how these feel on my skin and I am confident to pass a couple onto a friend with hand eczema. I recommend using a draining soap dish as they can become mushy if left in water. If you enjoy using solid soaps I highly recommend having a look at Solivia's website. These would make great Christmas presents for anyone especially those who enjoy eco-friendly products.